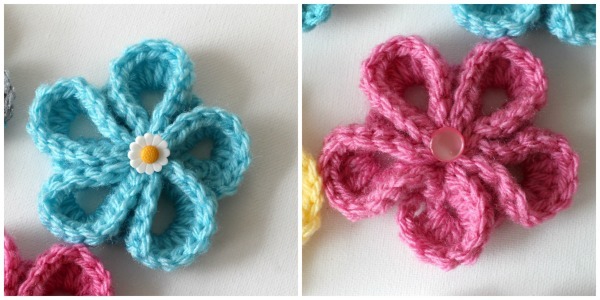 My girl Erin, has been crocheting again and found the cutest flower pattern. I just love the unique shape of these flowers with the deep curves of each petal that gives them lots of dimension. 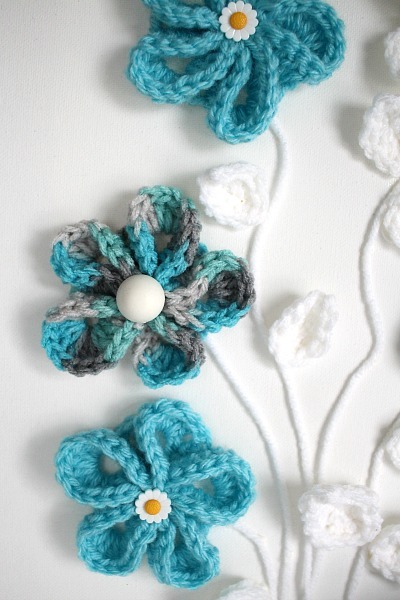 Make you own easy springtime crochet flower wall art with the video tutorial below. Erin and I both rummaged through our yarn stash for bright beautiful shades of yarn. 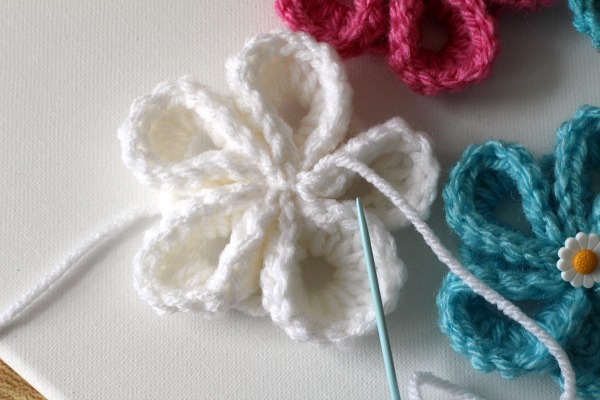 It takes only 20 yards of yarn to make each flower. You won’t believe how quickly you can make a bunch. And so we did. Pretty springtime colors and flowers in whatever leftover yarn we had. Adding a button to the center isn’t necessary but I think it looks cute mimicking real flowers. I looked through my old button tin to see if there was something that worked. I didn’t have enough for each flower to have the same button so I used two different button styles that were okay together. 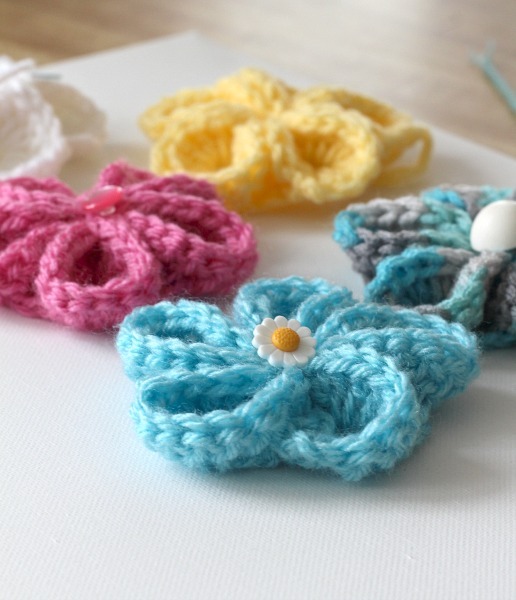 These cheerful flowers can be used in a variety of ways. They are lovely embellishments for pillows, bags and purses, attached to headbands or for hats. I wanted to brighten up the top of a storage cabinet in my powder room that has looked the same for far too long. 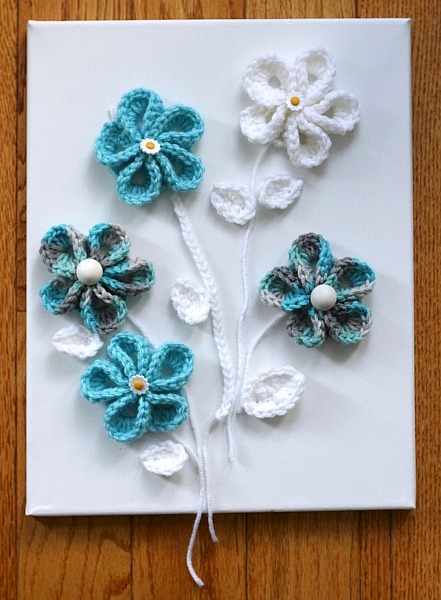 Keeping with the monochromatic colors in the room, I made flowers in aqua and white and attached them to a canvas to create an interesting piece of wall art. 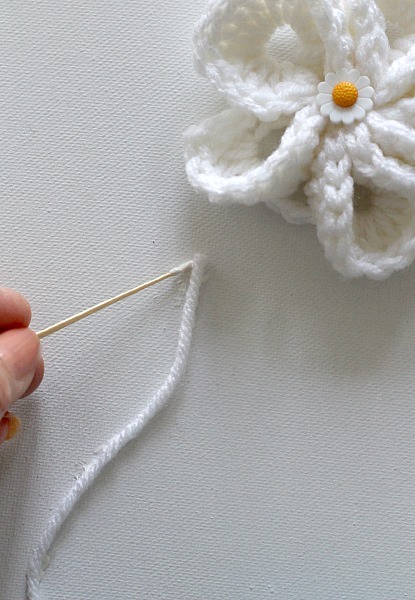 The little white leaves crochet up in a couple of minutes and the flowers can be made in probably 15 minutes. This whole project took less than 2 hours to complete. In the YouTube video (below), Donna Wolfe from Naztazia https://naztazia.com shares a great tutorial. 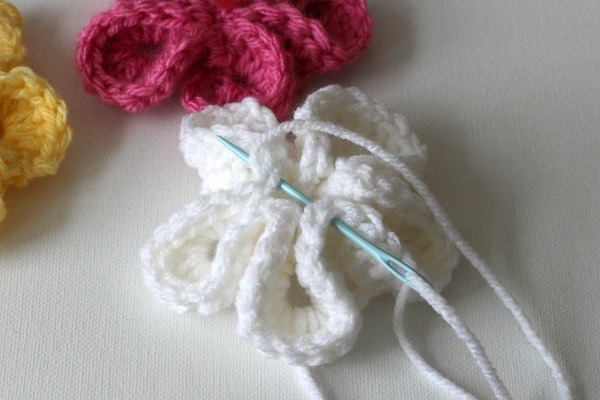 She suggests adding a few stitches to close up and pull the petals tighter in the center. This is the finished flower before a button was added. They are so cheerful, I wanted to make one in every color of the rainbow. 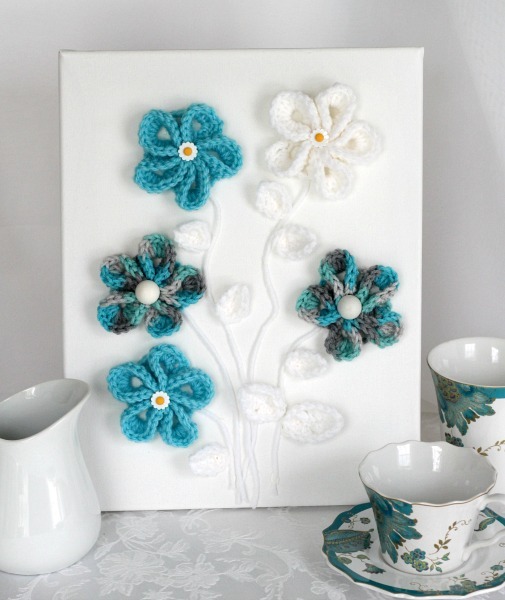 After placing the flowers on the canvas in a pleasing arrangement, I gave thought to the stems. 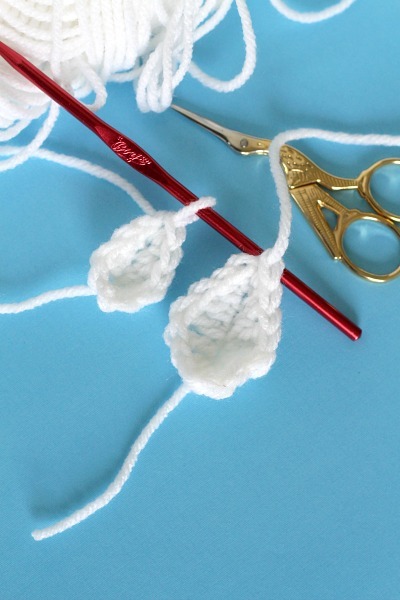 The thick stem in the center is a length of crochet chain. It looked too thick to me so I just used pieces of yarn. A few dabs of fabric glue holds the stems in place. Here are patterns for two different sized leaves that are worked in the same way. 3 sc in the last. dc, hdc, sc and slip stitch in the last. Finish off and tie ends. In this photo you can see the two different sized leaves. I like this new vignette in the powder room and it took little time and and cost to create. Check out all of Donna Wolf’s patterns @ Naztazia.com by clicking the link. 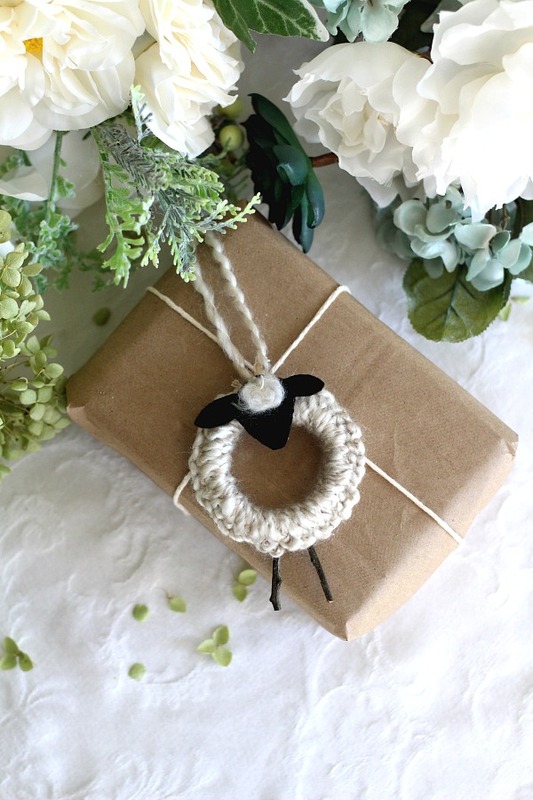 She is super talented and shares beautiful items. 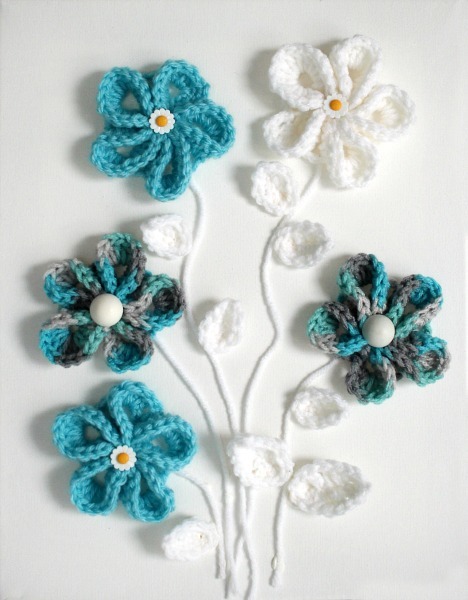 Your flower wall art is looking beautiful:)Thanks for sharing ! It's a great idea to turn them into wall art. Looks like a very cheery and fun project. I really like those!! The arrangement is lovely. Love these and I especially like how youput the on the camvas.